I can honestly and modestly say that I know a thing or two about fierce competitors in business. If you know anything about my background as a journalist, you probably think I’m referring to the CEOs with whom I’ve worked on books-“Chainsaw” Al Dunlap from Scott Paper and Sunbeam, Home Depot founders Bernie Marcus and Arthur Blank, or Commerce Bank founder Vernon Hill. But I’m actually thinking of one of my first bosses, George Tenenbaum. George was a huge S.O.B., a world-class sonuvabitch. And I think he’d take pride in that description. And it’s not that I didn’t like and respect him, either. I worked for him when I was 15, buying and selling comic books at a flea market in East Brunswick, N.J. and at conventions everywhere from Manhattan to Philadelphia. George treated me well- paying me fairly and feeding me decently, too. But he was a tough guy with whom to do business, especially considering the nature of his weekend business. Every transaction was a negotiation, a deal, a haggle. Buy a little, he’d try to sell you money. Come in to sell him your old comics, he’d talk you into taking a pittance for that prized Fantastic Four #1. He’d chase people down the aisles to get them to reconsider. No one walked away from George! He blamed the mistake on his wife, Rona. 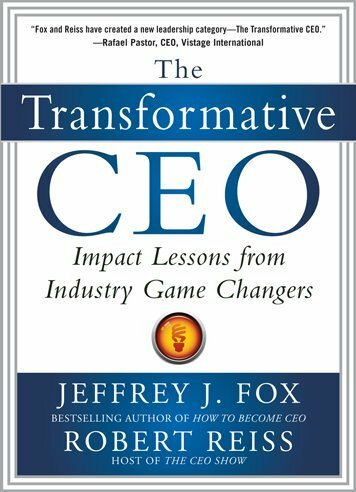 Order ‘The Transformative CEO’ by Jeffrey J. Fox, available in print or ebook from Amazon.com by clicking on the book cover above! He said, “Bob, let me explain life to you. When I screw up, if you’re here, I blame my wife. But if she’s here and you’re not, I blame you. And I guarantee you that if she’s here and I’m not, she’ll blame everything on me. The Harvard Business School, this was not. 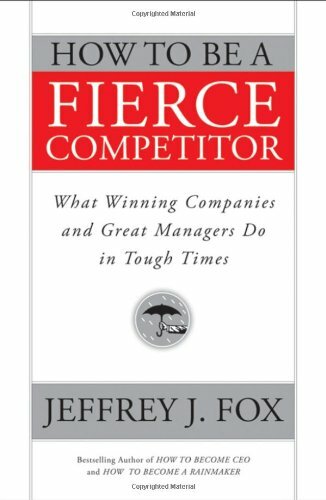 And this isn’t one of the 60 lessons in Jeffrey J. Fox’s latest book, How to Be A Fierce Competitor: What Winning Companies and Great Managers Do in Tough Times, but it certainly could be. Fox is the author of a growing series of business management books, including How to Become a CEO and How to Become a Rainmaker. He has a smart approach, producing compact how-tos that the average businessperson can read, absorb and apply in the course of a plane or train ride.